Kids are awesome. And kids that do good are the awesomest. Take for instance Lily. 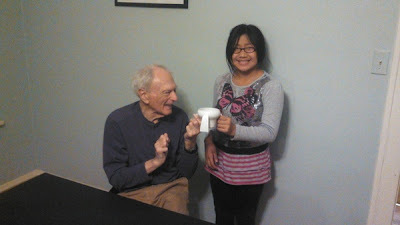 She wanted to make a cup that her grandpa could hold onto more easily (as she states in the video below, he has Parkinsons and his shaking was causing a lot of spills when he ate, and a lot of cleaning for grandma). Oh and she was 8 at the time. So with some initial modeling clay prototypes, she eventually fired up some ceramics and finalized her design. A trip to the Chinese city of JingDeZhen (apparently the ceramics capital of the world) to secure a manufacturer proved fruitful, and a crowd-sourcing initiative was born. There are 20 days left in her Indiegogo campaign, and she is more than 70% funded. This round of production will focus on creating ceramic cups, but according to the project's official website, they intend to produce plastic cups (think kid-friendly) in their next round of development. What a great story of accessibility, design, inventiveness and entrepreneurship. From a kid. Amazing. Oh and check this out: Lily's dad @JoeBorn, an entrepreneur in his own right, recounts on the Kangaroocup site that his Dad (aka Lily's grandpa) always buy the first of any product he produces. So here he is, buying the first cup. Look at how happy they both are! This story just keeps getting better and better.